May is Older Americans Month, and this year we’re celebrating the official theme “Unleash the Power of Age” with a series of posts recognizing people who have done some amazing creative work in their later years. This is the second in our four-part series. You can read the first post here. This post is about two women, connected by art. The first is Mary Delaney. Maybe you’ve never heard of her. I hadn’t – not until I picked up a library copy of The Paper Garden by Molly Peacock, our second subject for today’s post. Subtitled “An Artist Begins her Life’s Work At The Age Of 72,” Peacock’s book is part biography and part memoir, as the author alternates between relating Delaney’s life story and contemplating how her discovery of Delaney’s life and work impacted the author’s own creative journey as a poet and writer. Both women’s stories are compelling, and both show just how powerful creative work in the second half of life can be. Mary Delaney may not be a household name these days, but she did move in pretty high society in her time – 18th century England. Delaney grew up as a proper English noblewoman, with an aim towards marrying well. (Think “Pride and Prejudice.”) She did secure an advantageous marriage, except for the fact that she didn’t particularly like her husband, who was four decades her senior. Mary Delaney became a widow at the age of 24. The downside of that situation was that her late husband left her very little by the way of inheritance. The plus side, though, was that with her status as a widow, Delaney had a bit of freedom to move about society without as much pressure to find an advantageous marriage. That freedom allowed Mary Delaney to marry for love, almost twenty years after the death of her first husband, to Irish clergyman Patrick Delaney. They had a happy marriage of twenty-five years, during which Mary Delaney really began digging into her creative side, designing elaborate country gardens, doing shellwork and needlework, and delving into painting. When Patrick Delaney died, Mary Delaney was 68 years old and a widow for the second time. As one method to work through her grief, Mrs. Delaney made art. A few years after the death of her beloved, Mary Delaney began focusing on one type of artwork in particular: “paper mosaicks,” which were portraits of flowers made from cut paper. Mary Delaney’s mosaics were highly detailed and botanically accurate, using the tiniest pieces of paper and hand coloring to become authentic representations of their living models. Mrs. Delaney made nearly 1000 of these intricate, cut-paper depictions of plants, all between the age 71 and 88, when her eyesight finally failed her. Mary Delaney later died at the age of 88, leaving an impressive artistic legacy behind. What is most remarkable about Mary Delaney’s story, I think, is when her “life’s work” really started. 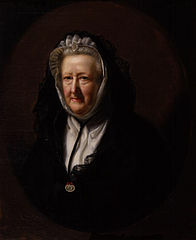 Mrs. Delaney spent seven decades being an 18th century English upper-class woman BEFORE she even started making the paper mosaics for which she is rightly remembered today. All of the experiences she had as a child in London, a young bride, a young widow, an older bride, and a widow again all played a part in the beautiful work she created in her 70s and 80s, even without the direct purpose of representing her life experiences in her art. Molly Peacock really drives this point home in her biography of Mary Delaney, and, in fact, I found Delaney’s story all the more interesting when viewed through the lens of Peacock’s discovery of this story. We often think of art as something static, something that gets put away in a box in a museum so that people can occasionally gaze upon it before going on their merry way. But what if we let art move us? What if we let the art that others created centuries ago motivate and inspire our own creative self-exploration? Peacock’s self-reflective passages in The Paper Garden provide a beautiful example of how old art can bring something new to our experiences in life today. Art can open up something powerful in each of us. Maybe it can even unleash the power of age – of all the stories and relationships and heartaches and joys that we’ve had over a lifetime. What would happen if you let the art move you further? I find all art interesting. While I can feel very self-conscious sharing in a public forum, exploring any of the arts in small groups where I have a senses of trust is a big charge. The more I explore the more I view the arts as integrated and integral to my life. Expressive Arts have truly opened up new doors for me. I have been doing “traditional fine arts” for my whole life, but just started to do Expressive art. To listen to music, and to move to the sound of the music and then draw how my body moves; or to find a feeling in your body – and express that on paper has been an amazing process. OMG. I LOVED this. Loved it with a big big love that’s…well…full of love. (Are you guessing yet that I loved it?) In my mid-40s I am finding huge creativity developing. I’ve seen this in other women as well. I think it’s brilliant. Never stop being creative! You have SO much more to give, every single day. Yay! I’m so glad you’ve found some inspiration here. It is SO TRUE that we have even more creative energy to share as we age. All those life experiences can add up to something incredible! It’s an honor to have The Paper Garden mentioned in your blog. Mrs. Delany is an incredible model for late-life creativity. Though she was primarily a visual artist, she did all kinds of art projects, AND she was a friend of Handel’s. She wrote a (now lost) libretto for Handel and played the harpsichord like the wind. Thank you for all your work Rachelle Norman! And thank you for stopping by, and again for sharing Mrs. Delaney’s story! Very inspiring, thanks for posting this. And very nice to see Molly Peacock pop in and comment as well!